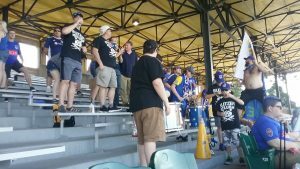 FC Buffalo, here shown in a game against Erie, has built up a following in the local soccer community. That’s the conclusion I reached as I prepared to watch my first FC Buffalo game at All-High Stadium. I had studied the team’s Twitter feed before the game, and found out that Erie was the arch-rival of my side. Just to make it more interesting, Erie was leading the East Conference of the Midwest Region of the National Premier Soccer League (NPSL). If FC Buffalo wanted to reach the playoffs, it had to go through the Erie Commodores FC to do so. In other words, this was a very tall order for our boys. They needed my temporary support. So I grabbed a friend and his young son, and we were off to the Main St. facility. I suppose if I really wanted to get the idea of the experience, I would have gone to Mes Que on Hertel, Buffalo’s soccer bar, for a pint before the game. I did see the FC Buffalo flag out front of the place earlier in the day, though, so I was sure a segment of the crowd would be fired up for Erie. That team would cross state lines that night in an attempt to pillage and plunder our city in a soccer sense. FC Buffalo has a small niche when it comes to the local sports scene. The team has been around since 2009, and the idea is to slowly but surely build up interest in the game. The roster is generally filled with 20-somethings. The NPSL is a huge, sprawling league with almost 100 teams. 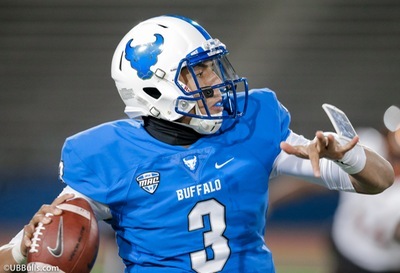 Buffalo is in a division with Erie (boo! ), Pittsburgh, Cleveland, Rochester, Syracuse and Binghamton. I haven’t spent a great deal of time in All-High Stadium over the years. That’s partly because I associate the place as the stadium where co-worker Tom Borrelli took a tragic fall that led to his death in 2008. But I have better memories of a couple of events there too. One is the Harvard Cup. This was the game played every Thanksgiving for the high school football championship for the city of Buffalo. It was shown on WNED-TV. When I worked at WEBR Radio, I usually was part of the team that broadcast the game in the 1980s. I learned pretty quickly that just about everyone with an interest in sports watched the contest, in part because there wasn’t much else shown on Thanksgiving morning. In 1984, I attended a Buffalo Storm game in that facility. The team was in the United Soccer League, and had such Buffalo Stallions (the indoor team at the time) on the roster as Dennis Mepham, Rudy Pikuzinski, Ernie Buriano and goalie Wieslaw Surlit. Dave Kerner and I were willing to see what it was like, and off we went to All-High one summer Saturday night. The New York Nationals were the opposition, and they were from New York City. As I recall the entire roster and front office were made up of people of Greek heritage. We had a seat in the old press box on the roof of the facility. It turned out that the coach of New York had been suspended for the game, and wasn’t allowed in the building. So he did the next best thing. He had someone connected with the team sit in the press box, and with the cheapest phone possible – sort of like the ones that Time magazine would send you for subscribing – do play-by-play of the game back to him in New York. In Greek. At halftime, the coach dictated his young assistant some instructions for the second half, and the young man headed down to the team to pass them on. Then he returned to the roof to describe the second half to the coach. I think Surlit led the Storm to a victory, but don’t hold me to it. I had hopes that I could bring some similar good luck to FC Buffalo in my return to All-High for soccer, but Erie had other plans. Right from the start, Erie moved the ball crisply into the Buffalo end, and stayed there for long stretches. Meanwhile, when our lads got the ball, it tried long breakout passes in an attempt to counter-attack. That’s not easy to do, and sure enough the ball soon came back into the Buffalo end. Soccer teams can play defensively for a long stretch and still come up with a win, but it usually doesn’t work too well. In this case, the Commodores struck for a goal in the 11th minute, and added another one about 11 minutes later. Fernando Martinez and Cam Philpot did the honors. The score was 2-0 at halftime, and there wasn’t much hope of a comeback. The Commodores did sit back a little more in the second half in an effort to protect the lead, and that led to a couple of good shots by the home team. One Buffalo player ripped a shot that bounced off the football goalpost that is several inches above the top of the soccer crossbar. Play technically stopped as soon as the ball hit the post, but a home team kicked home the rebound anyway to give the fans something to cheer about for a brief moment until they realized it didn’t count. In the 73rd minute, Jack Simpson forced a turnover deep in the Buffalo zone and scored easily. And four minutes later, Erie added a finishing touch with a goal off of a rebound. It ended up 4-0, and there was some pushing and shoving between the teams right at the end. Maybe these teams really do hate each other. The FC Buffalo website entitled the game story this way when the pillage and plunder was complete: “Playoff hopes end with a whimper.” Indeed. Our lads will not be taking part in the postseason this time around, having been eliminated from a chance at grabbing one of two spots in its grouping. * Your first question probably is along the lines of “How many people were there?” The best guess is something along the lines of 750. Tickets were $7 presale and $8 at the door – quite reasonable. The fans seemed enthusiastic and loyal throughout, and came across as entertained in spite the result. Extra credit goes to a group called the Blitzer Club that showed up with drums ready to cheer – and cheer they did, for the entire game. You could never tell the score by what the Blitzers were doing. They really made it feel like a European soccer game in that sense, even if it was difficult to carry on a conversation in the vicinity of the drums. * The coach of FC Buffalo is Frank Butcher. You might remember the name, as he is the coach of Grand Island High School. The Vikings have had plenty of success in recent years. I interviewed Frank a couple of times after Sectional games, and he was always friendly and knowledgeable. My guess is that our team is in good hands. * Most of the concession areas greeted fans before they even went through the gate, as food trucks were lined up in the street outside. A merchandise table was near that gate, and FC Buffalo has done a good job in that area. There were a variety of different t-shirts for sale, as well as a spiffy team scarf – which, based on looking around at the fans, is a popular item even on nights that aren’t fit for winter apparel. * This is not a big-time operation, naturally, so I couldn’t buy a program at the game to figure out who was who and add it to my collection of such things. However, it probably wouldn’t be a bad idea for the team to type out the rosters on a sheet of paper and run to Office Depot to make some copies to hand out. The league website doesn’t have much meat on its bones; its game summary of this contest only had a couple of the goals credited. * I still hate Erie. Win or lose, the fans support FC Buffalo.